On October 5, 2012, in the church of St. Ambrose of Milan, Putnam Valley, New York, Fr. Anthony (Bondi), Pastoral Vicar for Western Rite in the Russian Orthodox Church Outside Russia, presented to His Grace, Bishop Jerome of Manhattan, Vicar Bishop for Western Rite, Thomas Harry Cook of Nottingham, England, for ordination to the Holy Priesthood. Father Thomas was ordained in the Roman rite by Bishop Jerome, with Fr. Irenaeus Watson representing the priests of the Vicariate. Fr. Thomas will be Rector of St Edmund the Martyr Orthodox Church. He is the first Western Rite priest to be ordained by ROCOR for England. Fr. Thomas is married to matushka Jane and they have three children. Fr. Thomas has been Orthodox for six years and holds a B.A. with Honors from King's College, University of London, and a Certificate in Orthodox Christian Studies from the Institute for Orthodox Christian Studies, Cambridge. He will receive his M. Div. in December. The criminal background check required of all Western Rite clergy prior to ordination was completed by the Nottinghamshire police in June of 2012. Eine Frage in die Runde: Ist das für euch okay, oder würdet ihr bei einem (kanonischen orthodoxen) Priester mit einer Weihe, die nicht nach dem gebräuchlichen Formular gespendet wurde, nicht kommunizieren bzw. nicht mit ihm konzelebrieren wollen? Wenn er kanonisch orthodox ist hätte ich damit kein Problem. Die Frage stellt sich anders, denn so eine Entscheidung obliegt dem zuständigen Bischof. Das heißt, du hast keine grundsätzlichen Einwände? Der Synod der ROCOR ja schon im Juni 2013, deswegen - Internetspekulation, das Dekret beläßt es ja bei Andeutungen - die "Abmahnung". Es ist nach meiner Kenntnis grundsätzlich so, dass, wenn ein Priester einer 'anderen' Diözese in einer Gemeinde mitzelebrieren möchte, dies nur mit dem Segen des örtlich zuständigen Bischofs geschieht und zudem dieser Priester einen Nachweis seiner kanonischen Weihe bzw. seiner Zugehörigkeit zu seiner Heimatdiözese beibringt. Die verständlichen Antworten gehen manchmal unter; - deswegen nochmals nachträglich danke! Und wenn ein Hypodiakon einer 'anderen' Diözese in einer Gemeinde mitdienen möchte, ist dies ähnlich. Wenn du aber im Urlaub, außerhalb deiner Diözese bist, bleibst du dann orthodoxen Gottesdiensten und der Beichte und Kommunion fern, wenn kein Priester deiner Diözese vor Ort ist? Das ist eigentlich der Kern meiner Frage; das worauf ich hinauswollte..und was Hermann eindeutig beantwortet hat. Und wenn ein Hypodiakon einer 'anderen' Diözese in einer Gemeinde mitdienen möchte, ist dies ähnlich. Ich hatte tatsächlich den zweiten Aspekt Deiner Fragestellung („konzelebrieren“) bei meinen letzten Antworten im Sinn. Wenn du aber im Urlaub, außerhalb deiner Diözese bist, bleibst du dann orthodoxen Gottesdiensten und der Beichte und Kommunion fern, wenn kein Priester deiner Diözese vor Ort ist? Das ist eigentlich der Kern meiner Frage; das worauf ich hinauswollte..und was Hermann eindeutig beantwortet hat. Zum ersten Aspekt („kommunizieren“): Wie Hermann schrieb – man kann als orthodoxer Christ bei jedem Priester, der kanonisch orthodox ist, beichten und an der Kommunion teilhaben (vorausgesetzt natürlich, dass dieser nicht einem Zelebrationsverbot oder gar einer Enthebung aus dem geistlichen Stand unterliegt, s.a. den Abschnitt «Церковные наказания для лиц духовных» in Протоиерей Владислав Цыпин «Церковное право — Церковные наказания»). After celebrating Divine Liturgy in Nativity of the Mother of God Church at the New Kursk Root Hermitage in Mahopac, NY on the Saturday of the Great-Martyr Theodore Tyro, His Grace, Bishop Jerome, set out for Holy Trinity Monastery in Jordanville, NY, where he led the divine services for the first Sunday of Great Lent – the Triumph of Orthodoxy. At the All-Night Vigil, His Grace led the Polyeleos and singing of the magnification for the Holy Hierarch Alexis, Metropolitan of Moscow. The monastery’s Holy Trinity Cathedral was filled with worshippers –the monastic brethren, local faithful, and visiting pilgrims – who all came to venerate the Gospel and holy icons. Divine Liturgy the following morning was concelebrated by Bishop Jerome, eight priests, and seven deacons. Christ’s Holy Mysteries were administered from two chalices. His Grace delivered two sermons. The first was in Russian, on the phrase, "Blessed be the Name of the Lord," regarding the two greatest problems the faithful face in the Orthodox Church: indifference on the one hand, and fanaticism on the other. Both are opposite sides of the same coin, and that coin is ignorance. Indifference leads people to drift away from the Church, while fanaticism, based on incomplete knowledge of the Faith, leads to heresy and schism. The second was in English, on the "Anathema" service (the Rite of Orthodoxy) – what it is, and what it is not. The Rite of Orthodoxy was intoned by monastery cleric Deacon Peter Markevich. Both the Liturgy and the Rite that followed were served in Slavonic and English. Following Liturgy, a luncheon was served in the monastery refectory, during which a text by Metropolitan Philaret (Voznesensky) and Protopresbyter George Grabbe (later Bishop Gregory) was read, appropriate for this day. At the conclusion of the meal, those gathered were reminded that this was the namesday of Patriarch Alexey II (+2008) of blessed memory, and "Memory Eternal" was sung. A reception followed in the abbot’s residence, where the discussion revolved around liturgical reform and translations of texts into English. That evening, a group of Jordanville seminarians sang at the Triumph of Orthodoxy Vespers in at Nativity of the Mother of God Church in Albany. NY. New Clergy Ordinations & the Western Rite of ROCOR Expands Into Sweden! We would like to welcome these newly ordained clergy into the Holy Church! May God grant them MANY YEARS!!! On Saturday the 2nd and Sunday the 3rd of June, Bishop Jerome paid an archpastoral visit to Holy Trinity Seminary in Jordanville, NY, to take part in the graduation ceremony. 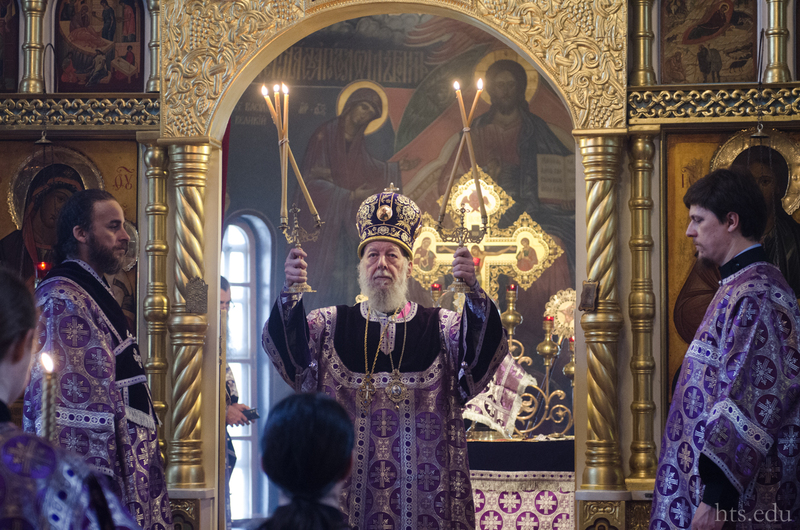 On Saturday night, His Grace led the All-Night Vigil and, on Sunday, was greeted for Divine Liturgy at Holy Trinity Cathedral; at Liturgy, he was concelebrated by 13 priests and 8 deacons – monastery and visiting clergy.